At OCP Summit 2019, one of the big stars was Facebook's new switch. 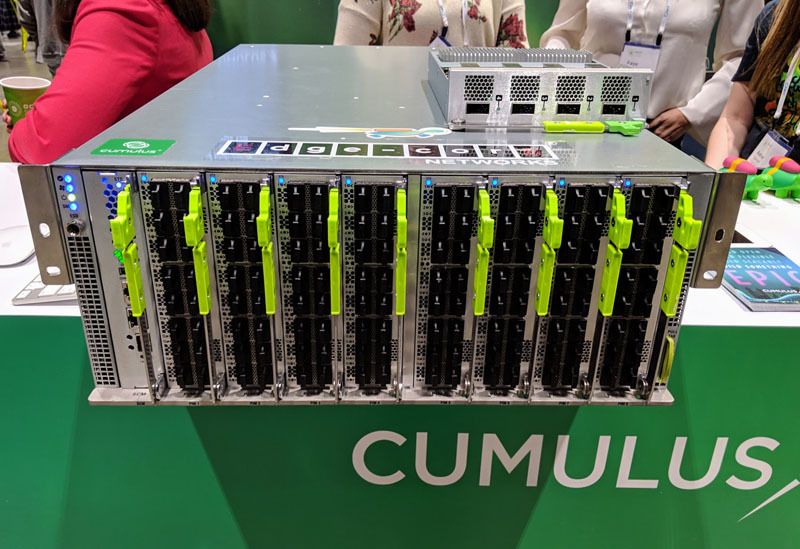 The Facebook Minipack is a modular switch that the company worked with Edgecore Networks (a division of Accton) and Cumulus Networks to open and bring to market. Last year the company showed off the Facebook Fabric Aggregator at OCP Summit 2018. As Facebook expands its data center footprint and faces daunting network growth, the company needed higher density switches to create flatter and more scalable networks. Facebook has another challenge: the availability of components like optical transceiver availability which the Minipack helps to alleviate. The Facebook Minipack switch is a modular switch following a trend the rest of the industry innovated on years ago. Based on the Broadcom StrataXGS Tomahawk 3 switch silicon the ASIC is capable of line rate 12.8Tbps Layer 2 and Layer 3 switching. The Broadcom Tomahawk 3 is perhaps the most broadly deployed merchant switch chip at this speed. That 12.8Tbps is commonly presented as 128x 100GbE or 32x 400GbE interfaces. With the Minipack, Facebook does not need to choose. Along the front of the Facebook Minipack are eight port interface modules (PIM) slots. Launch PIM options available for the Edgecore Minipack switch are the PIM-16Q with 16x100G QSFP28 ports and the PIM-4DD with 4x400G QSFP-DD ports. We saw QSFP-DD in our in-depth Dell EMC PowerEdge MX review. Using eight PIM-16Q modules yields 128x 100GbE and eight PIM4-DD modules yields 32x 400GbE. Packed in a 4U form factor, the Minipack allows Facebook to use less space than its previous Backpack based platform. Using one higher-capacity switch chip also means the company can reduce the number of switch ASICs in production. A direct benefit is lower power consumption and a flatter network topology.